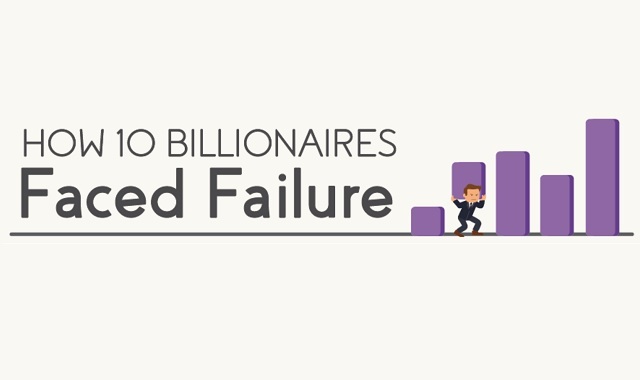 How 10 Billionaires Faced Failure #infographic ~ Visualistan '+g+"
The road to success is a difficult one that presents seemingly countless challenges along the way. Believe it or not, some of the most recognized billionaires in the world have had to take some very difficult roads to get to where they are today. This infographic from Quickbase takes a look at the journeys of some of the most notable billionaires, including some of the notable steps they had to take along the way. Did you know that Amazon's Jeff Bezos was a fry cook at one point, and now is considered to be the richest person in the world? Also consider that Microsoft's Bill Gates, who today boasts a net worth of $91.6 Billion, was once banned from school for hacking, and would eventually drop out of Harvard. Failure can lead to success, and these stories and quotes can truly help inspire anyone.